Introduction: In this article i am going to explain How to implement stylish jQuery form validation in asp.net with example. 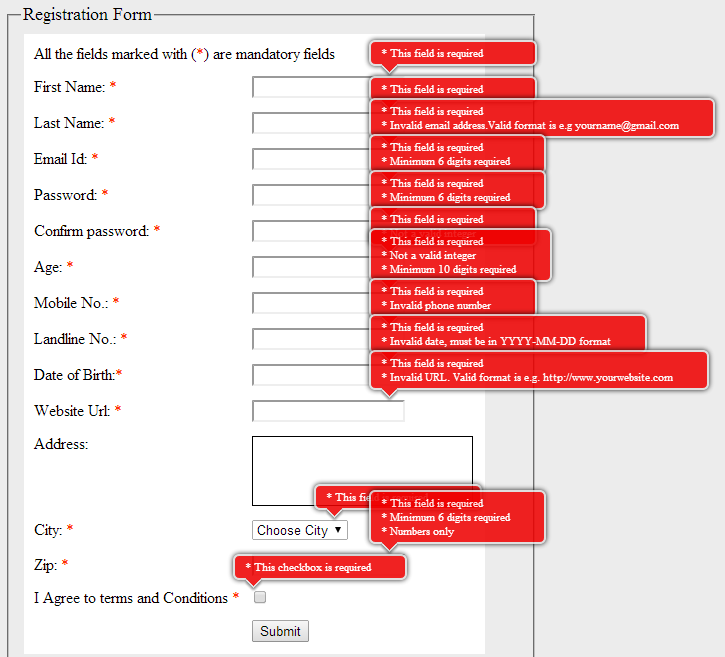 If validation fails for any field on the form then a stylish message box will pop up with the appropriate message as shown in image. Description: Whenever any developer creates any user input form like registration form, contact us form, change password form etc then it is mandatory to implement validation on the fields on the form to ensure that only valid data can be submitted to server for processing. First Name: Can’t be left blank. Last Name: Can’t be left blank. Email Id: Can’t be left blank and should be in valid email format. Password: Can’t be left blank and minimum 6 digits or characters are required. Confirm Password: Can’t be left blank and minimum 6 digits or characters are required and must match with the Password field. Age: Can’t be left blank and should be digits and minimum age can be entered 18 and maximum age 25 can be entered. Mobile No. : Can’t be left blank and should be digits and 10 digits long. Landline No. : Can’t be left blank and should be digits and valid. City: You must select the city. Zip: Can’t be left blank and should be digits and at least 6 digits long. I Agree to terms and conditions: This checkbox must be checked. First of all you need to download the sample project attached at the end of this article because "js" folder having required jQuery files and the "css" folder having style sheets is necessary for this implementation. Note: You can customize the validation rules as per your requirement by making changes in "jquery.validationEngine-en.js" contained in the "js" folder.
" 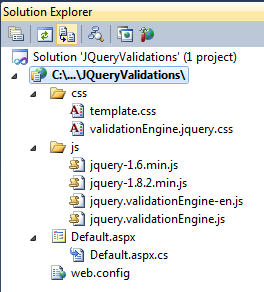 I hope you have got the best way to implement validation in asp.net forms using jQuery and If you like my work; you can appreciate by leaving your comments, hitting Facebook like button, following on Google+, Twitter, Linked in and Pinterest, stumbling my posts on stumble upon and subscribing for receiving free updates directly to your inbox . Stay tuned and stay connected for more technical updates." Hello sir...Can i give Validation Group on it. If yes then ...How to ?..Let me Know please...? Great Code, how do you reset the page and clear all the fields and CSS/Jquery validation errors?